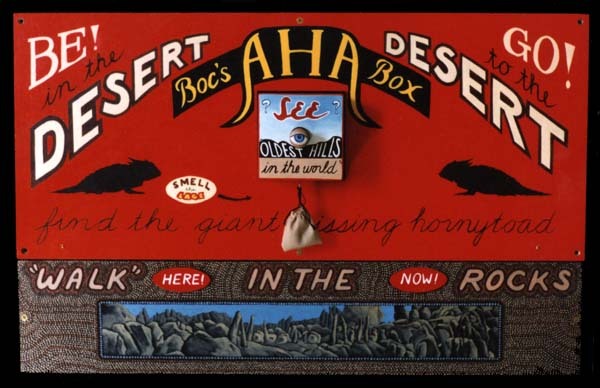 This is the front view of "Boc's AHA Box." It is oil on birch ply, 18"high x 28"wide x 16"deep. One of the key ingredients of the complex mixture of feelings I experienced during the three desert trips that inspired this work was the memory of weekend drives in the desert with my family in the mid 1940's. Those were the days when the monotony of the desert roads was punctuated with weird roadside attractions and the signs advertising their existence. The signs often made preposterous claims in an effort to capture a curious passing motorist. The lettering ranged from fancy to homemade and crude to nationally distributed Burma Shave signs. ;I wanted the AHA Box to have some of that flavor.